Purpose of Filing 2290 Form 2019 2020 Online: Trucking industry now becomes popular. To transport things from one place to another place, a truck is mandatory. Using a truck is so simple and easy. For easy transportation of material, most of the people use trucks. It’s a happy thing to use trucks. But when a heavy vehicle runs on public highways it may cause the damage of public highways. Also, it becoming a great risk to repair the public highways which include a huge amount. Therefore, an IRS decided to impose Heavy Vehicle Use Tax on heavy vehicles. Every heavy truck which runs on public highways must file & pay 2290 Form 2019 2020 or for the current tax period. What is the meaning of Heavy Vehicles? Who must file Form 2290? Know these details in this article and move on to file & pay IRS Form 2290 Tax. Who must File 2290 Form 2019 2020? Everyone who runs trucks on public highways needs not to file Form 2290 Online. Then, who needs to file IRS 2290 Form? The Heavy Vehicle Use Tax must be reported for the vehicles whose gross weight is equal to 55,000 pounds or more than that. Also, if anyone filing for 25 or more vehicles at a time, then they must File Form 2290 Online for 2019 2020. To file 2290 Tax Form 2019 2020, Efiling is the best process. For the faster processing of your 2290 tax return, 2290 Electronic Filing is the best way. Also, you can get IRS STamped Schedule 1 within minutes after immediate filing. IRS also encourages Online Filing and give a response immediately. Truckers need to remember that if you are filing for 25 or more number of vehicles then you must file 2290 Form 2019 2020 Online. You don’t have any option to file IRS Form 2290 with paper. Therefore, Efile 2290 to avoid risks and effort. 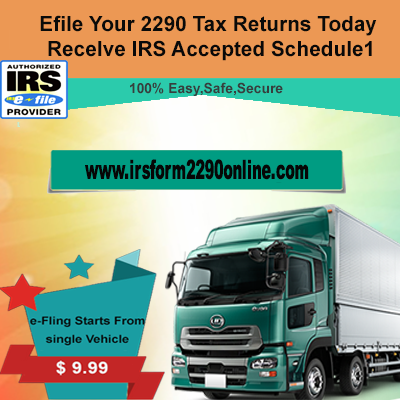 Also, choose the best IRS Approved Efile Provider such as irsform2290online.com and start your efile 2290 Form. 1. Truckers who are running the vehicles of gross weight 55,000 pounds or more need to efile 2290 and pay Heavy Vehicle Use Tax. File & Pay Heavy Highway Vehicle Use Tax if your gross weight is 55,000 pounds or more. 2. File 2290 Form 2019 2020 for suspended vehicles. If a vehicle is reported to an IRS with the 2290 Filing Form the after the mileage limit is exceeded for the vehicles then one must file 2290 Online and ay 2290 Online. 3. If a vehicle falls under a new category then also you need to E file Form 2290. File IRS 2290 Online during the current tax period, if the taxable gross weight of a vehicle increases. 4. You can also claim a credit when the vehicle is used to 5,000 miles or less (7,500 miles or else less for agricultural vehicles) during the tax period. 5. Also, claim a credit for the vehicles which are destroyed, sold, stolen, or for agricultural vehicles used 7,500 miles or less. 6. File & Pay Form 2290 Tax for the used taxable weight. For the fast-filing process, file Form 2290 in an Online. 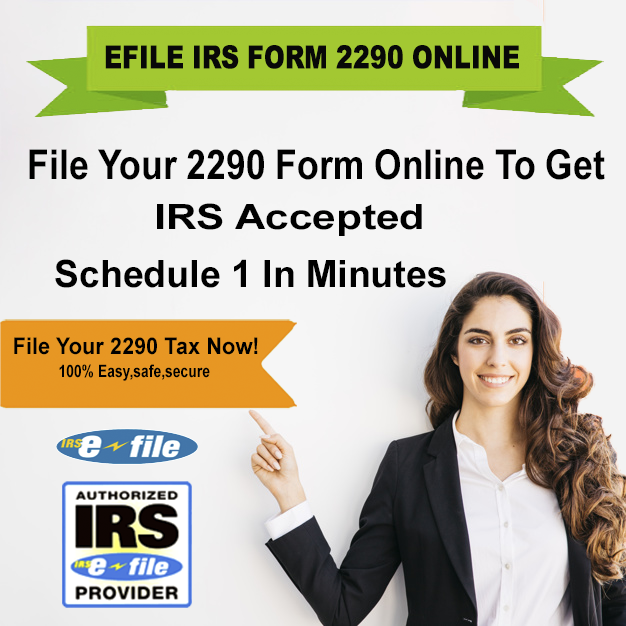 You can get immediate IRS Authorized Schedule 1 with Efile Form 2290. Filing 2290 Form 2019 2020 help you to avoid risk and the last minute of filing hesitation. You can finish the 2290 filing within minutes. Therefore, choose the efiling Form 2290 and pay Heavy Vehicle Use Tax easily. Filing with paper takes more time. Therefore, file Form 2290 Online for easy and fast filing. If you file Form 2290 with paper then you may miss the Form 2290 Due Date. If you file 2290 Tax Form Online then without moving anywhere, you can complete your Form 2290 Online Filing within seconds. Who need to File Form 2290? One must file 2290 Online if a heavy vehicle is registered or going to register on your name. 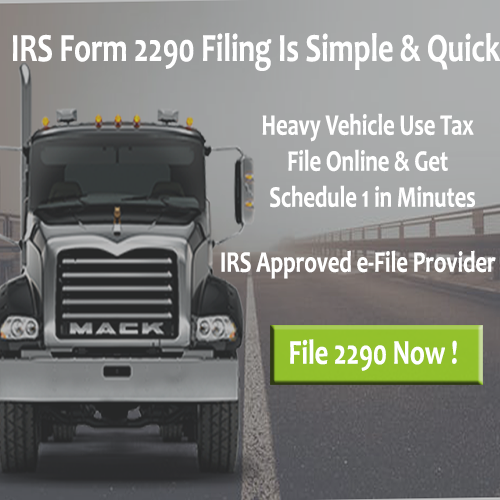 The heavy vehicle must be file IRS Form 2290 when it used for the first time. Let us see who must file 2290 Tax Form with an IRS. QSubs and eligible single-owner disregarded entities must file and pay Heavy Vehicle Use Tax to an IRS. They also claim a credit, refunds, and payments on their entities Employer Identification Number (EIN). All of these actions are takes place under the name of the Taxpayer Identification Number (TIN). If any vehicle of gross weight 55,000 pounds or more which is on the name of the owner and also on another person then the owner is responsible to pay Heavy Highway Vehicle Use Tax. This also applies to the same leased heavy vehicles. Any vehicle running under the name of any dealer license, or permit on the name of the dealer then the dealer must File 2290 Online. If a vehicle used to transport the products from and to the forested site then also one should file & Pay 2290 Online. This also applies if any heavy vehicle is registered and used to carry forest products. For the logging vehicles, the 2290 Tax is at a reduced cost. Either the vehicle consists of any load or not, if it’s vehicle weight is more than 55,000 pounds or more then the vehicle must be reported to an IRS.